Growing up, I spent many a fall day raking up the leaves on my parents’ front lawn only to have a gust of wind ruin my progress. My mouse control program consists of a two month service program that is designed to not only trap mice, but more importantly, determine the route or routes of entry for these rodents. Until we seal off these entry points, we are merely sweeping leaves on a windy day. 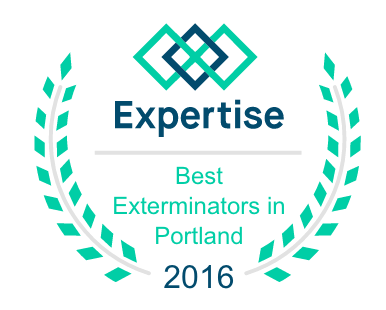 The average number of mice captured in an average-sized home here in the Portland area, in my experience, is five. This photo shows the results of exclusion and trapping two weeks after the initial treatment. 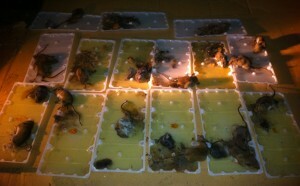 Yes it’s gross, but there are 19 mice captured here. These mice were living in the crawl space of the home, and the pressure to find food became great enough that they began to climb up into the above living space. If you hear scratching in the walls late at night, or see something scurry across the floor, or see dark pellets in the back of the kitchen cupboard, it might be time to give a professional a call. Call us at 503-575-0500 and we’ll put a stop to it.